The mission of the Italian G7 Presidency in 2017 is “Building the Foundations of Renewed Trust”. Citizens are increasingly skeptical of their governments’ ability to deliver on issues that affect their daily lives, ranging from security to environmental sustainability to economic well-being. Therefore, behind the mission of the Italian Presidency stands the notion that governments should first and foremost adopt policies aimed at meeting their citizens’ overall expectations. Faced with such challenges, Italy will rest the program of work of its G7 Presidency on three pillars. The first pillar will focus on assuaging the worries of citizens in a time of geopolitical instability. In particular, the Italian Presidency will make sure that the G7 continues to offer a fundamental contribution regarding foreign policy and security issues, with specific reference to crisis situations in sub-Saharan Africa and the MENA region and to the prevention of terrorism. A specific attention will also be given to the phenomenon of human mobility so as to orderly and safely manage the current migrant and refugee flows. The second pillar will focus on the application of the UN Agenda 2030 for Sustainable Development, particularly with regard to implementing the UN Paris Agreement on climate change, food security and nutrition (building upon the legacy of Expo Milan 2015), health, gender equality, women and girls economic empowerment and education. Furthermore, particular attention will be devoted to inequality, not just in income or wealth, but in terms of disparities and unfair practices due to gender or ethnicity, as well as differences in access to health systems and to education. The third pillar will be devoted to the deployment of a global, coordinated, intergenerational effort to make innovation the catalyst of worldwide prosperity and inclusive growth. Such an effort shall particularly aim at pursuing an orderly and fair transition towards the Next Production Revolution, via the adoption of pragmatic and long-sighted policies so as to ensure the strongest possible engagement with the stakeholders of innovation. 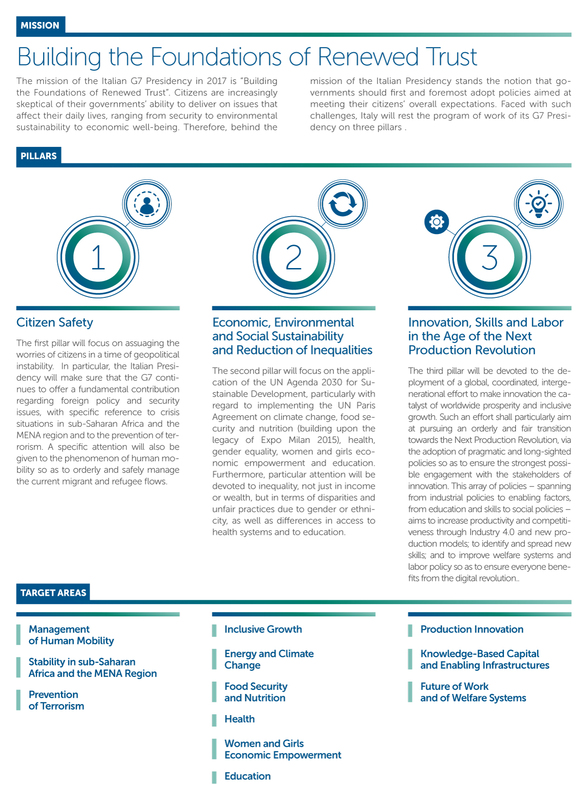 This array of policies – spanning from industrial policies to enabling factors, from education and skills to social policies – aims to increase productivity and competitiveness through Industry 4.0 and new production models; to identify and spread new skills; and to improve welfare systems and labor policy so as to ensure everyone benefits from the digital revolution.